The Configure Templates command is used to create or edit Templates: user-defined text blocks which can be inserted into any text file from a pop-up selection menu. Once Templates have been defined, they can be inserted with the Templates command. Templates are often used by programmers for defining the control structures of a programming language so that they can later be entered more quickly and without the chance of a typing error. The use of Templates, however, can be extended to facilitate the entry of any text, such as address blocks, copyright notices, phone numbers, part numbers, etc. If you need to unindent within a defined Template, use the tilde character (~) to designate the point at which the Backspace command should occur. The tilde will not be recognized in this way unless the Insert as if typed from the keyboard option is in force (see below). A Template Set is a collection of Templates. Up to 100 Template Sets can be defined. Up to 500 Templates can be defined within any Template Set. Use the New button to define a new Template Set. 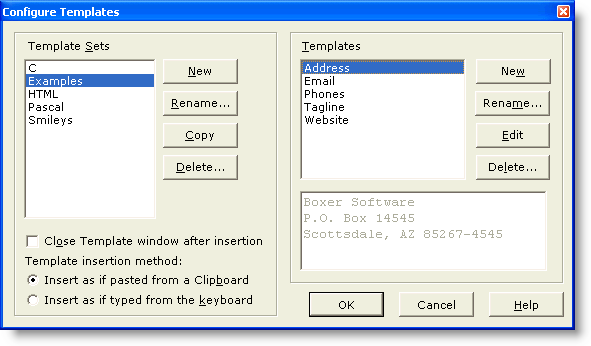 A pop-up dialog will appear into which the name of the Template Set is entered. Use the Rename button to change the name of an existing Template Set. Use the Copy button to make a copy of the currently selected Template Set. Use the Delete button to delete the currently selected Template Set. A confirmation is required before the deletion occurs. If a Template Set is accidentally deleted, you can recover it by using the Cancel button. Use this option to dictate whether or not the Template window should be closed after a Template is inserted into the edited text. Note that this option is maintained separately for each Template Set, permitting a different behavior to be defined as needed for different Template Sets. Use this option if you prefer that Templates from the current Template Set be inserted into the text stream as if they had been pasted from a Clipboard. When this option is selected, the Autoindent setting will not influence the indent level of template text. Note that this option is maintained separately for each Template Set, permitting a different behavior to be defined as needed for different Template Sets. Use this option if you prefer that Templates from the current Template Set be inserted into the text stream as if they had been typed from the keyboard. When this option is selected, the Autoindent setting will influence the indent level of template text, if the Template is inserted on an indented line. Note that this option is maintained separately for each Template Set, permitting a different behavior to be defined as needed for different Template Sets. If you need to unindent within a defined Template, use the tilde character (~) to designate the point at which the Backspace command should occur. The tilde will not be recognized in this way unless the Insert as if typed from the keyboard option is in force. Use the New button to define a new Template. First, a dialog box will be presented to get the name of the new Template. Then an editing window will appear into which the Template text can be typed. Use the Rename button to change the name of an existing Template. Use the Edit button to edit the content of an existing Template. Use the Delete button to delete the currently selected Template. A confirmation is required before the deletion occurs. If a Template is accidentally deleted, you can recover it by using the Cancel button. Boxer's Template information is stored in the file Template.ini, and its format is that of a simple text file, not a binary file. If you need to insert one of the special characters (| or ^) into a template in its textual form, use either || or ^^. If you need to insert the special character ~ into a template, use \~.